Mexican residents living in the shadow of eight prototypes of Trump’s planned border wall laugh at the idea that it will do anything to stop desperate immigrants from crossing the border. “The size of these walls is not going to matter,” said Rogelio Perez, 48, who lives in the trash-strewn sprawl of cinderblock homes and makeshift huts grouped around a lot for abandoned cars, in sight of the 30-foot (9 meter)-high concrete and steel models. “I even think they’ll try to cross with those pole vaults that they use in the Olympics,” he said. One eight-year old girl pointed without hesitation to a steel-like structure capped in a narrow brown cylinder, saying Trump should pick that model, because it would be the least likely to stop an immigrant. Salome Pacheco [the mother of the eight-year-old quoted above] said migrants would find ways to tunnel through, or resort to sea crossings to get into the United States. Meanwhile, residents of both sides of the border have been pushing back. Next door in Arizona, locals have been pushing back for nearly 40 years by using the U.S.-Mexico border fence as a giant volleyball net. Every year since 1979, the residents of Naco, Arizona join residents of Naco, Mexico for a volleyball match, called “Fiesta Bi-Nacional”, using the fence that separates the U.S. and Mexico as a net. Then, there are the unintended consequences if Trump’s wall is built. 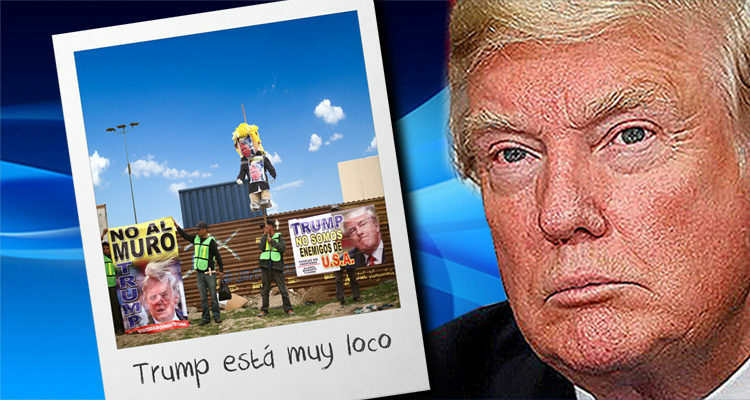 Last April, CNN reported that Trump supporters in Texas discover that the joke is on them, because they will end up living in Mexico if Trump’s wall is built.